Land Shark!! : It ends at 13! 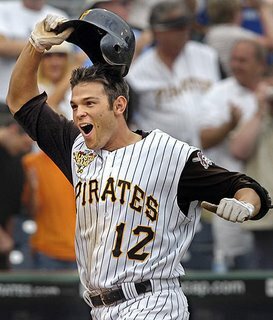 Well, I guess by writing about it this morning, I was able to change the tide of losing and the Pirates won!!! Thanks to my write-in vote for the All-Star game, Freddy Sanchez, and his walk-off bottom of the 9th home run. Way to go Bucos, you ended it at lucky number 13!! Update 6/30: Here is a great column by Ron Cook that talks about how unbelievably awful that Jim Tracy is. I completely agree with what he has written. Especially the part about all the former Pirates coming into town tonight.